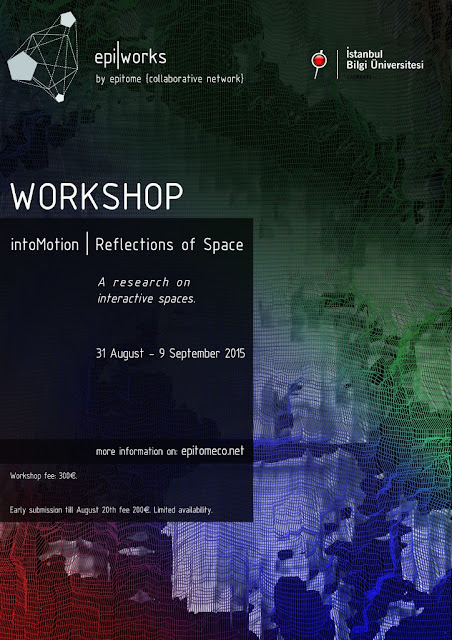 Explore the relationship between space and its parameters in the workshop IntoMotion / Reflections of Space. Participants will create a full-scale pavilion which is in constant feedback and interaction with its surrounding environment. The overall pavilion design will be developed in scope of effective and selected parameters and their spatial sense. We will discuss the concepts of adaptability and responsiveness with various scenarios. We will introduce different techniques of kinetic systems and sensors. For the first three days of tutorial sessions we explore tools such as Grasshopper and Arduino, as well as working on selected techniques of creating kinetic systems. In the Grasshopper sessions we will introduce Kangaroo, a physics engine plug-in for Rhino, to explore form finding strategies. Later, in the Arduino sessions, we explore basic coding and tools (sensors, motors etc.). On the third day, participants divide into groups to develop their own interactive modules in relation to form finding experiments for the pavilion. The groups will explore kinetic systems and investigate interaction potentials and passive systems that can be installed. During the workshop week, the final design will be manufactured and assembled in 1:1 scale with digital fabrication tools. The workshop will also include lectures by international professionals, to be announced later. It will be held in the Faculty of Architecture, Istanbul Bilgi University.